A public art piece in El Paso that was abruptly removed by city officials earlier this year is raising questions about censorship. 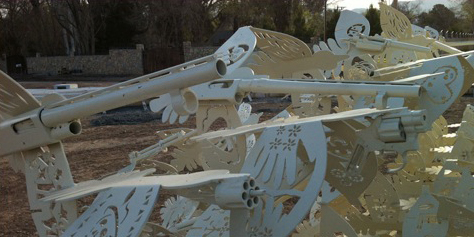 The metal sculpture depicted a flock of birds carrying off fragments of guns once used to commit crimes. The resulting controversy reveals a city struggling to define itself in the aftermath of a brutal drug war that hurt both sides of the U.S./Mexico border. The trouble began when local artist Margarita Cabrera decided to change the design of a city commissioned work she calls “Uplift.” The sculpture originally incorporated confiscated gun fragments in its concrete base. Later she decided to weld the gun fragments onto the sculpture itself, putting them in clear view of the public. “We have a shared history of violence here in the border…and I wanted to celebrate the change that we have seen in years past where that violence has really diminished,” Cabrera said. In 2008, a turf war broke out between two rival drug cartels in Ciudad Juárez, just across the border from El Paso. More than 10,000 people were killed, including Americans. Many Juárez residents fled to El Paso. Three years ago, the violence began to dissipate and today much of Juárez is getting back to normal. Cabrera said her sculpture symbolizes that return to peace. She invited the participation of hundreds of people in El Paso and Juárez to collaborate with her in creating the artwork. 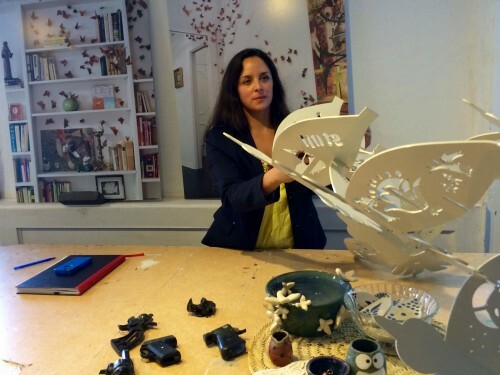 She set up workshops in elementary schools, university campuses and the Mexican consulate where strangers partnered to create designs that would be cut into her sculpture. But during the installation of “Uplift” on a newly constructed roundabout last March, some neighbors were alarmed by the guns. “It clashed so much with the peaceful setting that’s being created there and…it was offensive to an number of people,” said Alma Ramsey who belongs to a local neighborhood association. Ramsey emailed her city representative expressing concern over the prominent display of firearms. Hours later, the city manager ordered the sculpture removed. The email exchanges were made public thanks to an open records request by an independent journalist. Cabrera turned to the media saying her work was being censored. “It is devastating to me…because this piece has been broken down and cut away,” she said. “The artwork has fulfilled its function of igniting dialogue and discourse in the community around violence and whether or not it is or should be visible,” she said. Cabrera insists she shares a similar vision with both cities. Cabrera is considering suing the city of El Paso. Meanwhile, her sculpture remains locked away in a warehouse. 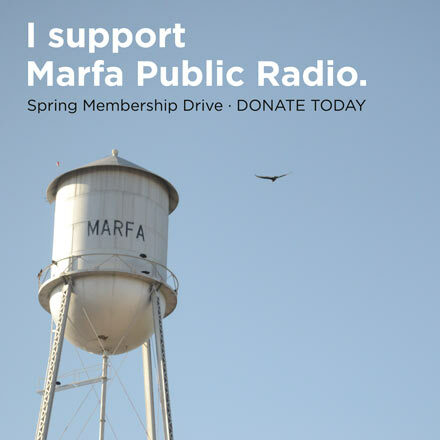 This entry was posted in KRTS Music and tagged art, Border Issues, culture, El Paso, Fronteras Desk, guns, Juarez. Bookmark the permalink.